The Thirty Meter Telescope (TMT) will help solve some of the deepest mysteries of the universe and will be the largest, most advanced telescope ever built when it opens. TMT has also been in the news off and on for a number of years as the project has moved through its proposal and design phases, dating back to 2003. But recently it has been in the news in a big way (particularly in Canada), as Prime Minister Stephen Harper and Industry Minister James Moore announced that the Canadian government would provide an additional $243.5 million (approx. $200 million USD) over 10 years in funding for the construction of the next-generation telescope. 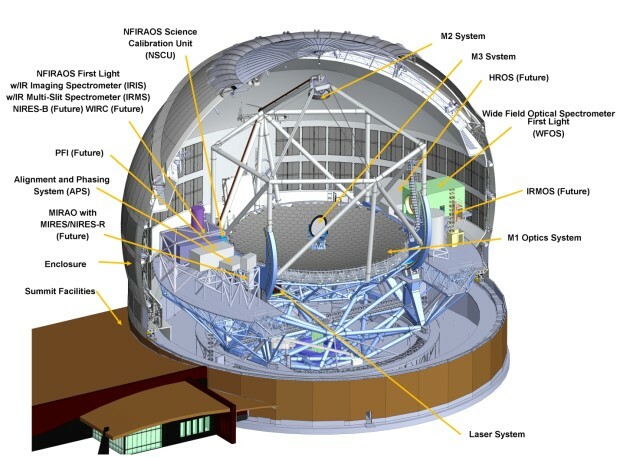 This money will be spent primarily in three areas: construction of the metal frame for the telescope dome (to be built by Dynamic Structures Ltd.); Supplying the advanced adaptive optics system, a centrepiece of the TMT design (the National Research Council of Canada is managing this), and; operating costs. Canada already contributed about $30 million during the design phase, and the Association of Canadian Universities for Research in Astronomy (ACURA) has played a significant role – alongside the University of California (UC) and the California Institute of Technology (Caltech). What follows is a plain language overview of the TMT project and what the Canadian funding means for it. A schematic of the Thirty Meter Telescope (Source: TMT). The Thirty Meter Telescope will be, in short, the largest and most advanced ground-based optical observatory ever built when it is completed sometime in 2022. The project is led by a consortium of UC and Caltech. Those two schools between them account for a 25% stake in the project. Japan is also on board with a 20% stake. Canada comes next, with the $243.5 million accounting for a 15-20% stake. China and India each have a 10% stake. With Canada’s contribution in place, the TMT has achieved 80% of the capital funding required, and the team continues to negotiate with other potential partners to secure the remaining funds. Construction though is underway, with the ground-breaking that took place in October 2014 officially kicking it off. There are whispers the U.S. will come on board via a National Science Foundation (NSF) grant, but as yet that hasn’t happened. 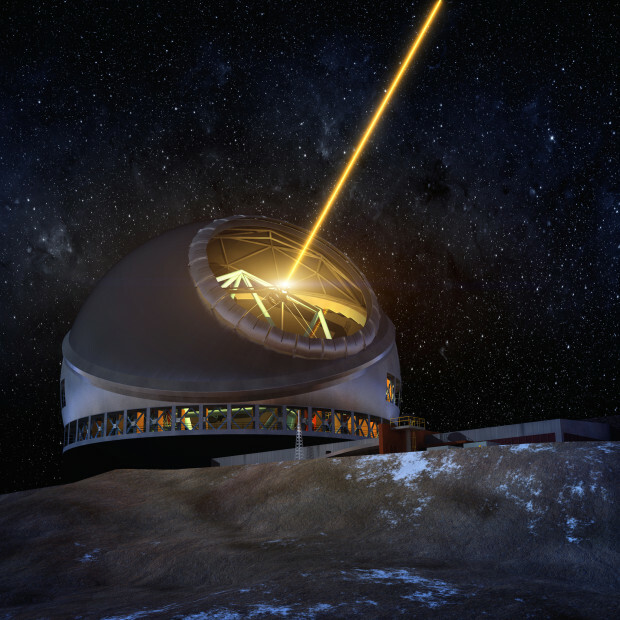 TMT will be built atop the Mauna Kea volcano in Hawaii, with an elevation of about 4 kilometers. 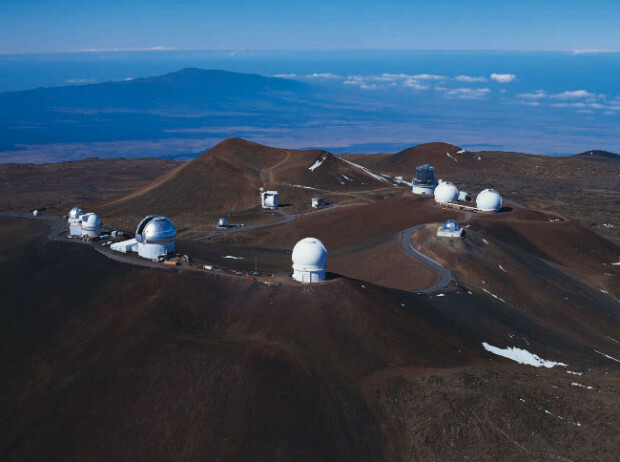 The observatories atop Mauna Kea, Hawaii include, from left to right foreground: the UH 0.6-meter telescope (small white dome), the UK Infrared Telescope, the UH 2.2-meter telescope, the Gemini Northern 8-meter telescope (silver, open) and the Canada-France-Hawaii Telescope. On the right in the background are the NASA Infrared Telescope Facility (silver), the twin domes of the Keck Observatory and the Subaru Telescope (Source: University of Hawaii). In telescopes, size matters, and so the TMT’s primary mirror at 30m (98 feet) will be three times larger than the current largest, the Gran Telescopio Canaris (10.4m, opened in 2007) at La Palma in Spain’s Canary Islands. The extra diameter will provide TMT with ten times the light collection ability. The same size comparison holds true for the twin W. M. Keck Observatories (10m each), which will coincidentally be TMT’s neighbours at Mauna Kea. And while second in size, Keck is often considered one of the most advanced optical telescopes currently in operation thanks to the highly advanced adaptive optics they were retrofitted with about a decade ago (more on adaptive optics later). Keck 1 opened in 1993 with Keck 2 following in 1996. Another famous telescope – perhaps the most famous – is of course the Hubble Space Telescope, launched in 1990. TMT will have 144 times (!!) the light collection ability over Hubble’s 2.4m mirror. TMT will also provide about 10 times better image resolution. 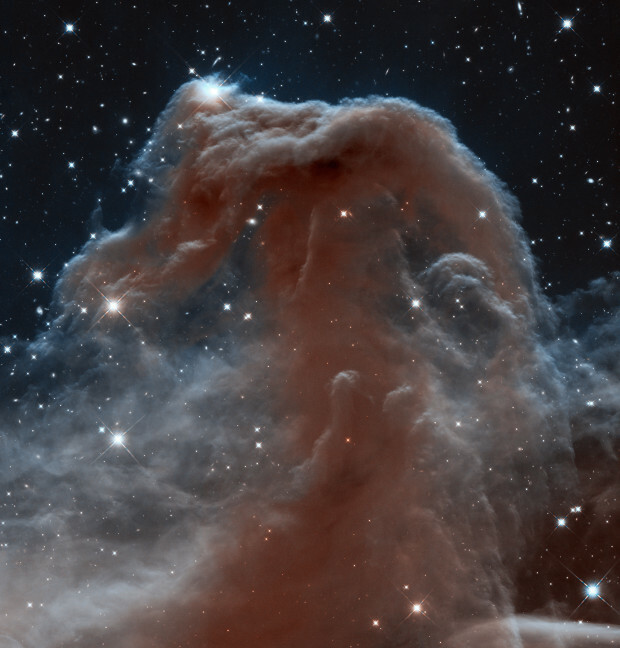 The Horsehead Nebula (Source: NASA/Hubble Space Telescope). TMT will have 144 times more light collection and 10 times better resolution than Hubble. Though by the time TMT is completed, there will be other kids on the telescopic block. The Giant Magellan Telescope at Las Campanas Observatory in Chile will likely have opened – it’s currently looking to be completed in 2021. Though at 25.4m, the GMT’s rein as world’s largest telescope will be short-lived. Of course, 25.4m is nothing to sneeze at – it will still be 2.5 times larger than the present-day biggest. Similarly, TMT will only be the world’s largest for a few short years. Sometime around 2024-2025 the European Extremely Large Telescope (don’t you love the naming convention for these bad boys?) is expected to be completed at the European Southern Observatory (ESO) in the Atacama Desert, Chile. The E-ELT’s primary mirror will be fully 39.3m in diameter. These three mammoth ground telescopes – the GMT, TMT, and E-ELT – represent a generational leap forward in terms of size, technology, and ability to peer deeper into the cosmos than ever before. As a scale comparison, imagine a professional baseball stadium. If the TMT were placed on the pitcher’s mound, the primary mirror would nearly fill the entire infield. The structure is also 22-stories tall. But why does size matter so much? It matters because the size of the mirror is directly proportional to the amount of light the telescope has the ability to collect. And more light means the telescope is able to produce sharper images and detect fainter objects, allowing the astronomers to see objects and detail that otherwise wouldn’t be possible. But, if it’s so important to have telescopes collect the maximum amount of light, why haven’t they been built this large before? A couple reasons. First, as it often boils down to, is money. Building large telescopes is expensive (both TMT and E-ELT come with a total price tag between $1 and $1.5 billion each). But money alone only really tells part of the story here. The underlying basis for why telescopes haven’t been built this large before is the second reason: technology. The relevant advances in technology are similarly revealed mainly in two places: segmented mirrors and adaptive optics. Segmentation allows huge mirrors to be broken down into smaller pieces, which in turn allows for more straight forward construction, transportation, maintenance, and so on – all of which reduces cost. Large mirrors are extremely difficult to manufacture, heavy to support, and challenging to move around. For instance, could you imagine a 30m single piece of glass being moved up the side of a 4km tall volcano in Hawaii, to say nothing of getting it to the island in the first place? TMT has two additional mirrors: a secondary (3.1m) and a tertiary (elliptical, 3.5×2.5m). The secondary mirror is placed above the primary mirror in order to collect the light from it. The secondary mirror then reflects the light back down towards the tertiary mirror, which directs the light to the instrument suites. The 30m TMT primary mirror will actually be made up of 492 smaller mirrors. Each hexagonal piece of glass being 1.4m long corner to corner, spaced 2.5mm apart, and 4.5cm thick. It’s worth mentioning though that TMT won’t be the first telescope with segmented mirrors; it was pioneered on Keck, and since used on other observatories as well, including the Gran Telescopio Canaris. GMT, E-ELT, and the next generation James Webb Space Telescope (set to launch in 2018) will all employ segmented mirrors, too. But mirrors, no matter how large, won’t do you much good if you can’t get a clear view of the sky – and that’s where adaptive optics comes in. Any telescope on Earth has to contend with the atmosphere. That blanket of layers of fluid air, all swirling around and wreaking havoc on anyone trying to get a clear view of objects in space – particularly small or faint objects, which coincidentally are the focus of a great deal of astronomy nowadays. Even with your own eyes you have to contend with atmospheric turbulence if you happen to go out stargazing. That twinkling you see when you look at stars? That is actually caused by turbulence in the atmosphere distorting the light as it passes through (the stars don’t really twinkle at all, at least not for the purpose of this discussion). Telescopes have to contend with the same interference, and the result – if left uncorrected – are blurry images that lack the required level of detail that astronomers require to push the frontier of understanding further forward. In order to overcome this, a way has been devised to correct for the atmosphere by manipulating the shape of the mirrors in the telescope. Two corrective mirrors in TMT will have highly precise actuators attached, which will be able to very finely reshape each mirror in real-time to create a clear image. Left: The Galactic Center without adaptive optics (Source: Keck Observatory). Right: The Galactic Center and central black hole, Sgr A*, with adaptive optics (Source: Keck Observatory and the UCLA Galactic Center Group). The physics behind this technology, in a nutshell, is that when light is disturbed by the atmosphere it creates a distortion in the light wave. By reshaping the mirrors, an opposite distortion can be created in the telescope, cancelling out the atmospheric distortion. The TMT’s actuators are controlled by a computer system, which in turn relies on a system that measures atmospheric turbulence. This measurement is accomplished by either pointing the telescope towards a guide star or firing a laser beam into the sky to create an artificial star, which the telescope can then image in order to measure the distortion and correct for it in real time. Similar to segmented mirrors, TMT isn’t the first telescope to make use of a new technology. Others, including Keck, have been retrofitted with these optical systems as the technology has developed over the last decade. TMT is however the first telescope ever to be constructed with adaptive optics as a core piece of the design. TMT, many like other telescopes, is also being constructed in a place where the impact of weather (including cloud cover) will be minimized. In being on top of a mountain 4km above sea level, TMT will not have to deal with as much weather as it would at a lower elevation. Being higher up also helps to reduce some of the atmospheric distortions, as the thickest part of the atmosphere is the part closest to sea level. An illustration of the Thirty Meter Telescope’s laser guide system (Source: TMT). More light, higher resolution, clearer view – what do they hope to find? Astronomers working on TMT will have a full suite of scientific instruments at their disposal, so the telescope will essentially be able to be used to study anything and everything in the cosmos. But in terms of ushering in new discoveries, in broad strokes, TMT will be ideal for studying the origin of the universe and exoplanets. Understanding the nature of the universe, how it – and by extension we – ended up here is a significant question for science and astronomy to try to unravel. TMT will take full advantage of its massive mirror to peer back in time and capture the faintest light from the earliest moments following The Big Bang. By observing how ancient stars and galaxies formed, it will advance our understanding of why things are the way they are, and inform what the forces at work in the universe are today. TMT will also help to fill in gaps about the structure of the universe and the role that dark matter plays. In terms of exoplanets, TMT will have the resolution to directly image worlds orbiting other stars. Using spectroscopic instruments, astronomers will also have the ability to measure the composition of those worlds – and whether they could be hospitable for life. Thirty Meter Telescope will perceive things that no other human-built technology has ever been able to see. In so doing TMT will help to answer two of the most fundamental questions of our existence: how did we get here and are we alone. The next generation of discovery is just beyond the horizon today, but it’s exciting to know as a human that before long, we’ll have it in our sights. As a Canadian, it’s exciting to know that my nation will play a significant role in those discoveries and the benefits that follow from being a leader in research and technology development. In an announcement on Monday, December 2 that didn’t garner much fanfare, the Canadian Space Agency (CSA) may have won the lottery – or at least been handed a potentially winning ticket. In the announcement, Industry Minister James Moore laid out the government’s response to the findings of the Emerson Report, also known as the Review of Aerospace and Space Programs and Policies led by former minister David Emerson. There are five key action items the Government of Canada will now undertake, including the release of a five-year plan for Canada’s space program to be released next year. Four of those action items, while excellent goals, are however written in – let’s call it – less than concrete language. Words like “establishing a space advisory board” and “examining opportunities for the private sector to support the CSA’s activities” are great. But these words don’t necessarily lead to significant, measurable results. One of the action items however is different. And no, I’m not being sarcastic. The Space Technologies Development Program (STDP) is run by the CSA with a mandate to, essentially, invent new technology. The STDP works to find solutions to never-before-encountered problems, like “how do we use a robot to survey the underside of a Space Shuttle while it’s in orbit” kind of thing. It works to create projects that enable space missions to be successful. It also works to support industrial capacity through developing new products, processes and know-how. The program currently receives a paltry $10 million annually. With Monday’s announcement, it will jump to $20 million by 2015; modest still, but at least respectable considering the potential payoffs. The STDP program is important in different ways. First is the impact that space technology has on each of our lives, every day. Technologies like sun glasses that are scratch resistant and provide UV protection, water filters used by the Red Cross in disaster areas or on your camping trip, sports bras and workout clothes that ‘wick’ away moisture, cell phone cameras, and infrared thermometers that go in your ear to take your body’s temperature are all direct descendants of the space program. The list of space technologies that have been adapted to benefit our lives does, very literally, fill books. 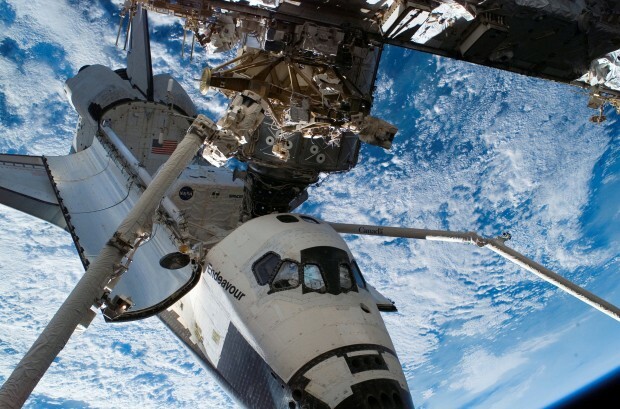 A significant Canadian contribution is the Canadarm that flew aboard NASA’s Space Shuttles for 30 years, and now the newer Canadarm2 that is a permanent fixture on the International Space Station. Technology from that robotic arm – that we designed and built, right here in Canada – has now been applied to a miniature version that is capable of performing delicate surgery while inside MRI machines, as the doctor safely operates it remotely from outside. Today, Canadarm’s baby cousin is saving lives. 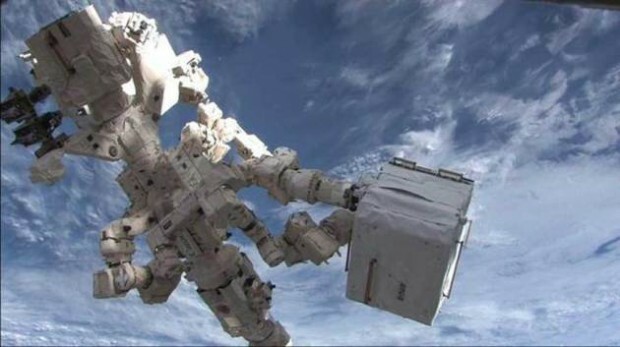 And in space, the next generation of the Canadarm is something called DEXTRE – a robotic handyman that can potentially repair and refuel satellites, which could be big business in the years to come. Which brings us to the economic impact of space development. Space agencies, of course, have their own employees. The CSA also has contractors for some of its projects. But private industry is where, ultimately, the majority of jobs – and wealth – is created from investment in the space program. This is due to the nature of the projects being undertaken by space agencies. They’re not ordinary projects with ordinary goals. The goals are, pardon the pun, out of this world. Only this ground-breaking work can spur true innovation and invention. As a space agency solves problems – in partnership with private industry – new technologies are developed. Once the technology is developed, the private sector is able to utilize that knowledge to create new products and new ways of doing things – all while employing Canadians. And that drives our economy. In Canada the aerospace and space sectors employee more than 170,000 people in well-paying jobs. It contributes more than $27 billion to our economy. But the CSA only received about $400 million in funding in 2012-13. That’s less than 0.2% of the federal budget. And in a world where budgets are tight and spurring the economy is a priority, to say that the space sector provides a strong return on investment is an understatement. Finally, space exploration has significant meaning for our national identity. 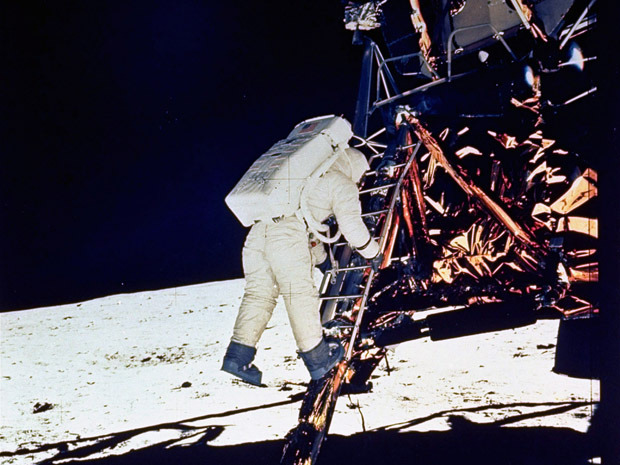 From technological achievements like the Canadarm to the landing pads that touched down on the Moon during the Apollo-era – yes, part of Neil Armstrong’s lunar lander was built in Canada – we have certainly left our mark. But ‘our mark’ isn’t just historical. It’s happening today, too. Canadians built parts of rovers that are, as you read this, driving around on the surface of Mars. We launched satellites the help humanity to better understand how the weather works. We were one of the first nations to launch telecommunications satellites – and continue to be a global leader in this field. And not to be overlooked, recently retired Canadian astronaut Chris Hadfield is arguably now the most famous astronaut since Neil Armstrong walked on the Moon in 1969. We’re good at this stuff. It inspires young and old alike. And while this may seem like an a bit of an obscure announcement – doubling the funding of a program you’re probably never heard of – thanks to Mr. Moore, the CSA may now have the winning ticket – because who knows what the next invention that changes the world will be. Though one thing is certain: today there is a better chance that it will be invented right here, at home. Recommendation 1: The government explicitly recognize the importance of space technologies and capacity to national security, economic prosperity, and sustainable growth, and the Minister of Industry bring 10-year, 5-year, and annual government-wide priorities for the Canadian Space Program to Cabinet for discussion and approval each spring. Recommendation 2: The government establish a Canadian Space Advisory Council, reporting to the Minister of Industry, with membership from industry, the research and academic communities, the provinces and territories, and federal departments and agencies. 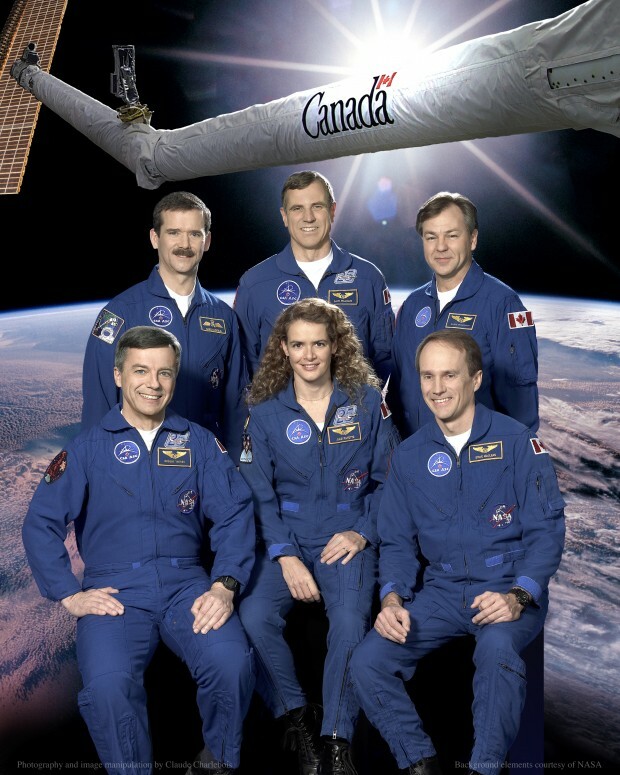 Recommendation 3: A deputy minister-level Space Program Management Board be created to coordinate federal space activities, project-specific arrangements be put in place to ensure disciplined project management, and all agencies and departments with a role in the Canadian Space Program be required to report on how they are implementing priorities set by Cabinet. Recommendation 4: The Canadian Space Agency’s core funding be stabilized, in real dollar terms, for a 10-year period; major space projects and initiatives be funded from multiple sources, both within and beyond the federal government; and increased international cooperation be pursued as a way of sharing the costs and rewards of major space projects and initiatives. Recommendation 5: The scope of space projects, project timelines, and performance requirements be finalized as early as possible in the project definition phase. 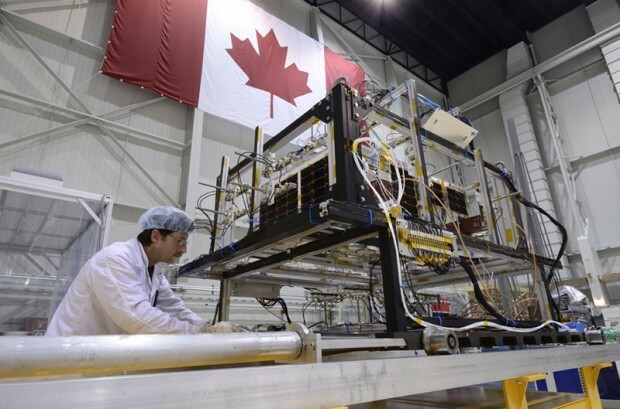 Recommendation 6: Space asset and service procurement processes be competitive in nature and proposals be assessed on the basis of their price, responsiveness to scoped requirements, and industrial and technological value for the Canadian space sector. Recommendation 7: Total funding for the Canadian Space Agency’s technology development programs be raised by $10 million per year for each of the next three years and be maintained at that level. Recommendation 8: Where costs are modest and there is no risk to public safety, the government create conditions conducive to the expansion of space-related commercial activity. I’ve done a couple time-lapse videos, though this was my first attempt at an overnight sequence. Overall I’m pleased with the result, though I’m limited by the lens on my camera. It’s diameter is only 58mm, so my light collection isn’t phenomenal. Down the road a proper wide-angle lens is on the wish list. This sequence was shot on the night of September 5, 2013. The camera is looking west, at an angle of about 45°, from the shore of Lake Nipissing in North Bay, Ontario. Over the summer Ashley and I have taken it upon ourselves to learn to scuba dive. There’s no real reason for it – no major travel planned – but it was something we were both interested in and so we decided there’s no time like the present. 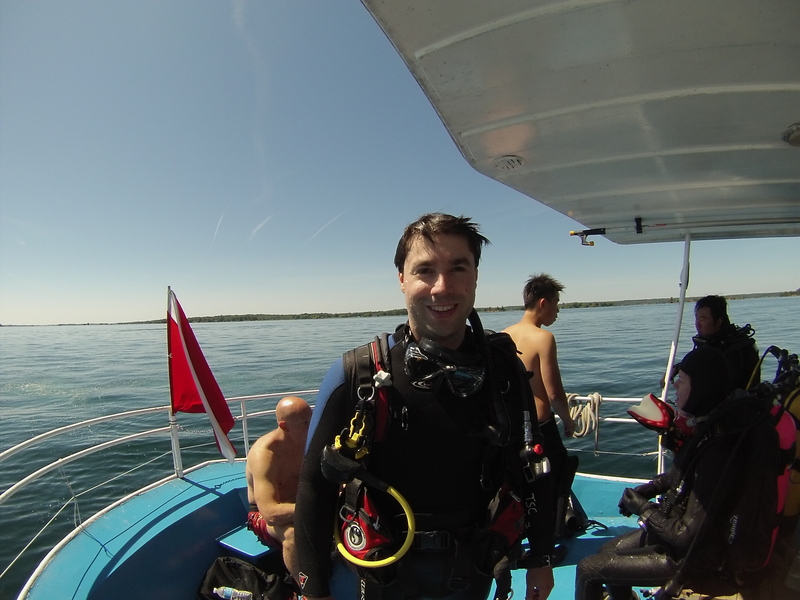 So back in May-June we did the PADI Open Water Diver course with the Toronto Scuba Club (a friend of mine had done a course with them a couple years back and thought they were good, and since I trusted his experience, that’s where we signed up). The course consisted of two mornings in a classroom, two afternoons in a school pool, and a weekend in an actual lake for our checkout dives (though in this case the actual lake was one called Gulliver’s Lake – a manmade rectangle the size of a couple soccer fields and about 20 feet deep). We had homework to do ahead of the classroom sessions, written tests once we got there (though it would take effort not to pass them), and we were checked repeatedly on our practical skills in the pool and the lake. From the classroom/pool session, the highlight for me was twofold – though both experiences happened at the same time. One of the skills you have to master as a scuba diver is how to empty a flooded mask (as water will, invariable, get into your mask at some point) while you’re underwater. It’s a simple enough procedure of tilting your head back, blowing out your nose, while simultaneously pressing the top of your mask against your forehead. In that maneuver holding the top of your mask against your head prevents the air from escaping; this allows the air to displace the water in the mask – which quite literally drains out the bottom (even though you’re underwater!). On my first attempt to do this though, when I tilted my head back and pressed the top of my mask against my forehead, for some reason I inhaled through my nose. Considering I was in a pool filled with water, this was of course not the correct thing to do. Naturally, having just inhaled a bunch of water, I started coughing. But this lead directly to my second highlight: learning to trust my equipment. When you’re underwater with scuba equipment you have a regulator in your mouth so that you can breath. With modern regulators though, you can do a lot more than just breath while they’re in your mouth. You can sneeze, cough, puke, burp – whatever. And while I didn’t test all of those, I certainly did test the coughing capability – and it worked perfectly. I was able to breath and cough without any difficulty underwater. This was an important realization, and it put me at ease: whatever happened, as long as that regulator was in my mouth, I could breath. And once I was done coughing, I successfully cleared my mask. On the open water checkout dives (the weekend at Gulliver’s Lake), we were being tested on the various skills we had learned in the classroom and the pool, except now we were in a lake 20 feet deep instead of a pool 9 feet deep. Overall, it didn’t really feel any different. The equipment was the same. The company was the same. Though it was nice to be outside for the weekend – and being outside did allow for two new experiences: first, actually being able to swim some distance without hitting the wall of a pool; and second, compass navigation. Being able to swim more than six feet before running out of real estate was an important opportunity to work on buoyancy (as you want to be neutrally buoyant, i.e. “weightless”, as much as possible – which is achieved by adding or removing a little bit of air to a piece of equipment called a BCD – “Buoyancy Control Device”). Working on compass navigation was also fun – and it brought me back to my days of doing IFR flight training. When we had time for a free dive, Ashley and I actually successfully navigated both square (40 kick cycle) and triangle (50 kick cycle) patterns underwater (in very poor visibility) on our first attempts. I was proud of us for that success. 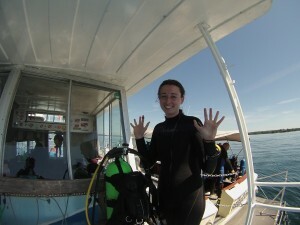 At the end of that weekend, Ashley and I were both PADI certified Open Water Divers. But! We didn’t stop there. 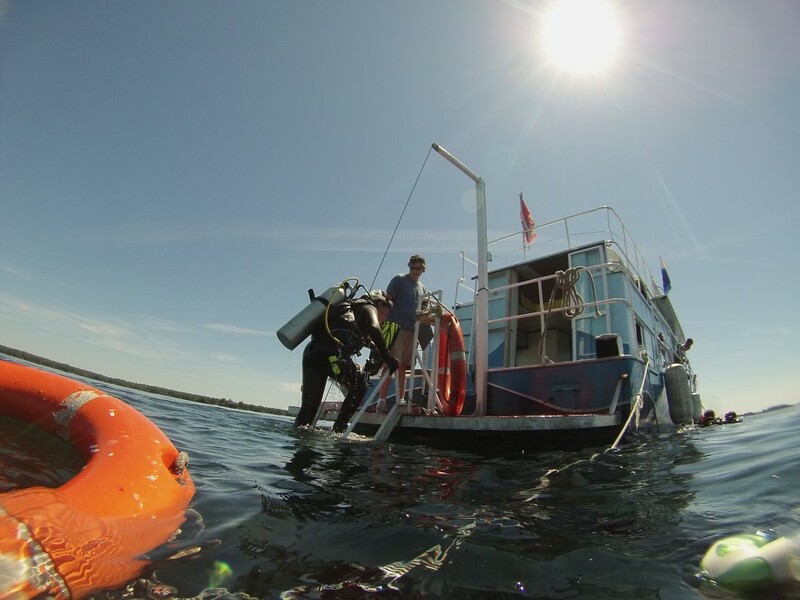 Having enjoyed the experience, we decided to continue our training and do our Advanced Open Water certification during a weekend trip to Rockport, Ontario in August. The Toronto Scuba Club operated this excursion as well. I would compare moving onto the advanced certification similarly to how I felt transitioning from my Private Pilot Licence to my Commercial Pilot Licence. We weren’t learning anything new per se; rather we were learning how to apply what we already knew in a more refined, precise way – which allowed us to take our scuba diving to new depths – pardon the pun. For the advanced weekend, we were in the St. Lawrence River (finally a real body of water!) in the 1000 Islands area of eastern Ontario. To complete the advanced certification we had to complete some reading material ahead of time and complete five dives over the weekend. The dives were deeper and in a more challenging environment than we had experienced before, but the skills were the same. Simply getting accustomed to the environment struck me as the only real challenge, as I was comfortable with my equipment and confident in my abilities. Of the five dives we did (deep, wreck, night, navigation, and drift) the one that stands out in my mind the most was the night dive. It was amazing. It felt like a combination of watching a National Geographic video about exploring the ocean floor with the experience of going on a spacewalk (there’s a reason astronauts train for spacewalks underwater!). For more on the advanced weekend, just watch the video at the top of the page – it shows you what we did. Also, I mentioned a couple times that aspects of scuba training reminded me of my flight training. And it really did, from start to finish. I’m not sure exactly why – perhaps the technical aspect, perhaps some personality similarities between flight instructors and scuba instructors, or maybe the comradery amongst the divers – but it was a very familiar and comfortable feeling from the onset. 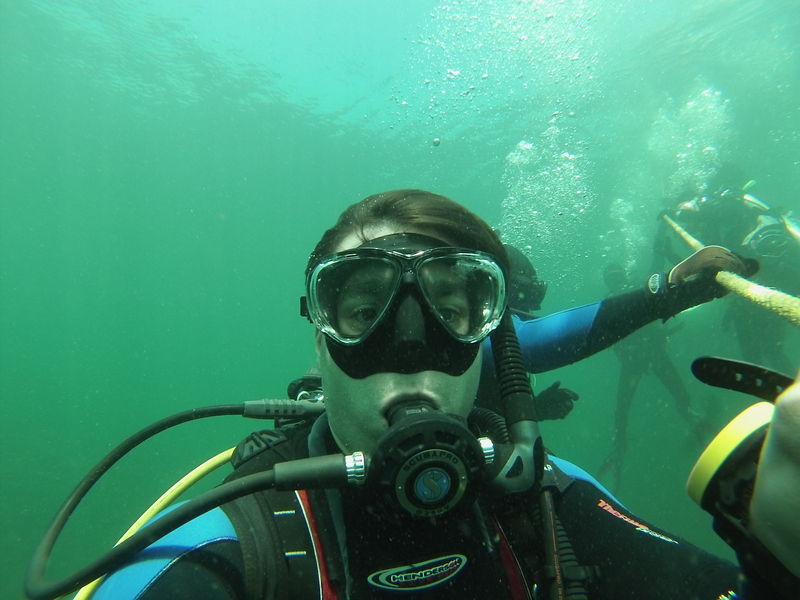 In any case, if you haven’t tried scuba diving, I highly recommend it. 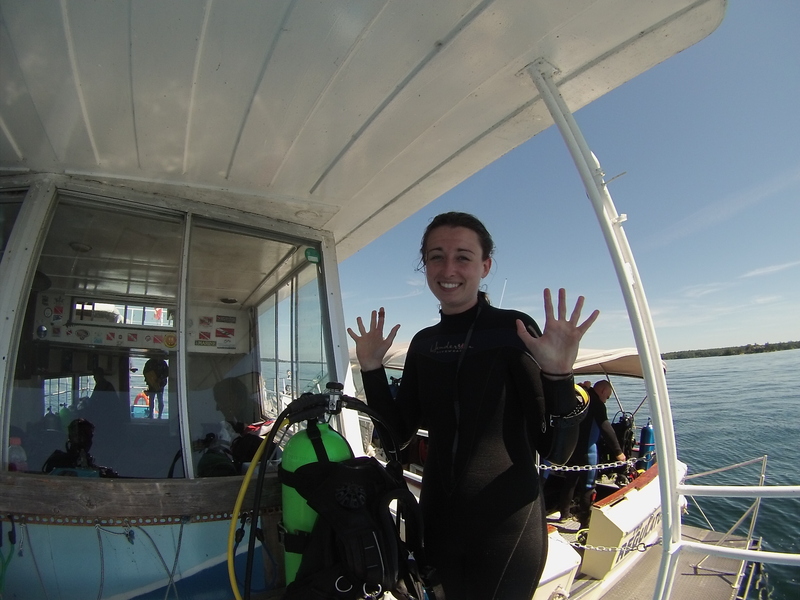 It was a fantastic experience, and I can’t wait to see where we’ll dive next!